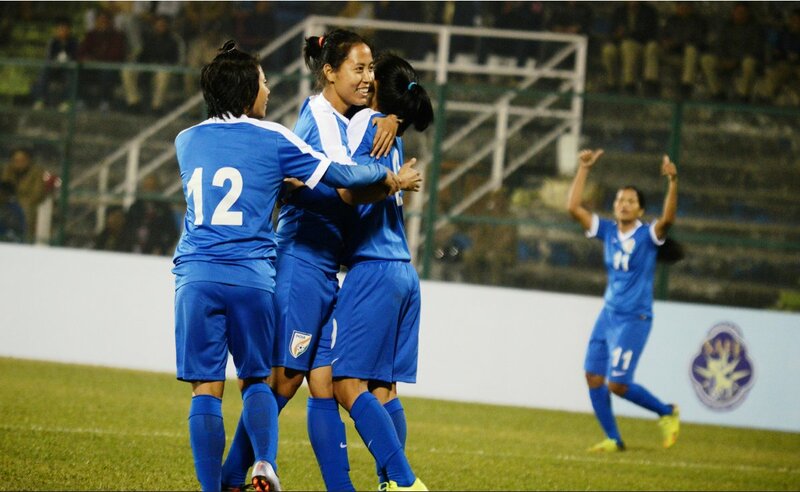 India Women's Team start their SAFF Championship 2016 campaign in style as they rout Afghanistan by a whopping 5-1 margin in the Group B opener at the Kanchenjunga Stadium in Siliguri today (December 27, 2016). Kamala Devi opened the scoreline in the third minute even before the spectators could settle. The early goal instilled more vigour into the Indian girls to change the gear in their pursuit of more goals. At the stroke of the half-hour mark, the referee awarded a penalty in the favour of the hosts and 'AIFF Women's Player of the Year' Sasmita Malik didn't waste the chance to double the lead from the 6-yard spot. Afghani girls were trying to consolidate the game in the middle but India netted the third goal three minutes later from a brilliant piece of individual skill of Kamala Devi. She sneaked past the opposition defender from the left, cut into the penalty box and whacked the back of the net, leaving the goalie stranded. In the dying minutes of the first half, Grace joined the party to take the scoreline to unassailable 4-0. After the changeover, it was a completely different Afghanistan outfit who came out of the dressing room and the game was not a one-way traffic anymore. Afghanistan players tried to control the game from their half and started building up attacks to break the Indian defiance. Although the Indian defenders show their resilience to thwart the Afghani girls' every effort, finally the deadlock was broken two minutes to the end of the regulation time. Muhtaz Farkhunda tapped it home to net their first goal of the tournament sending the Afghanistan dressing room into a delirium. Three minutes later, 'AIFF Emerging Player of the Year' Sanju nailed the final one in the Afghani coffin to seal the victory for the defending champions. India are slated to take on neighbours Bangladesh on the last day of the year while Afghanistan will meet Bangladesh in their must-win fixture on December 29, 2016.